Tsuyoshi Chitose is the soke of Chito Ryu, a martial art that possesses techniques which balance the strengths and weaknesses of Naha-te and Shuri-te; both originating from the martial arts of the To (T’ang) Dynasty in ancient China, incorporating its Kata and developed in Okinawa, and (is) based on physiological/surgical medicine. Chito Ryu has a duty to aim for the healthy growth of the youth who will take over in the next generation. Despite the original style of a direct-attack type karate, from its inception the use of protective gear was mandatory at Chito Ryu competitions. Tsuyoshi Chitose was born in 1898 in Kumochi, Okinawa. He was a delinquent boy who broke things and did things he was told not to do. Tsuyoshi Chitose, or the Gochoku began To-De at the age of 7 years under the tutelage of Aragaki Seisho, a 5th generation instructor. Aragaki, an expert in Naha-te, did not accept students readily, but Gochoku’s family had been involved in the martial arts for generations, and because of this heritage he was accepted as a student. Although he is not well known in mainland Japan, Aragaki-Ou was a grand master of Naha-te and well known in Okinawan martial arts circles; Higaonna Kanryo was one of his disciples. Incidentally, Gochoku is a junior disciple (deshi in Japanese) of Kanryo, and he was a good friend of Chojun Miyagi, the founder of Goju-Ryu. As part of the training in To-De, Aragaki-Ou made his students do quite unique and unusual exercises. For example, there was leaping from bent tree branches, running on the surface of coral, jumping up while immersed in water to the shoulders, and so on. The purpose of these exercises may have been to develop a sense of balance, speed and springiness in the body; however, Gochoku worked hard at these exercises without really realizing their purpose. Under the tutelage of Aragaki-Ou, Tsuyoshi Chitose was trained in Sanchin, Koryu (classic) kata and Bo-jutusu, etc. ; at the same time he also trained in Shuri-te. Today it is unthinkable that one would learn the techniques of two totally different schools such as the more profound ‘Naha-te’ whose development was centered in Naha City, and the nimble and swift form of ‘Shuri-te’ which had its development centered in Shuri City, and at a time when much discord existed among the different schools and groups. But it was not totally unusual at that time, especially in Okinawa. To extend one’s knowledge is to heighten oneself, which is considered to be natural for anyone studying the martial arts. Those were the good old days. Why did Tsuyoshi Chitose want to learn not only Naha-te but also Shuri-te? The one purpose was to redress the strengths and weaknesses of both systems. Gochoku possessed especially strong interest in the martial arts. It was almost as if he was born that way. From Shuri, CHINEN Sanda Ou, with OSHIRO Chomo and FUNAKOSHI Gichin (the founder of Shoto-kan Ryu and Gochoku’s elementary school teacher) he learned Bojutsu. 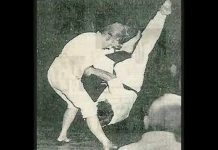 From HIGAONNA Kanryo Ou, with friend Miyagi Chojun, learned Kata Saihawah (Saifa), Se-pai, Kururunhawah (Kururunfa), Tensho. From Shuri, MOTOBU Choyu, he learned Kata Unsu, Wansu. From HANASHIRO Chomo he learned Kata Jion. 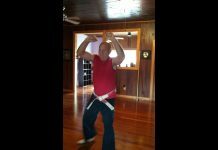 From Naha, Kurumai Mura, KOJO Ou and MAEZATO Ou he learned Sai, Nunchaku, Tonfa, Tsuken Sunakaki kata. Gochoku’s martial arts titles are Chito-Ryu Ju-Dan Hanshi, Kendo Roku- Dan, Judo Go-Dan, etc. There are countless more titles if Kobudo and so on are included. Tsuyoshi Chitose worked especially hard at becoming skilled. To polish his skills may be too simple an expression. Gochoku may have been eager and driven just to become strong. There are some anecdotal stories about Gochoku when he was in the full vigor of his youth. Tsuji in Okinawa is well known as a location for field competitions; this is where those who are confident of their own skills fight each other. Gochoku went around looking for those who claimed themselves to be the strongest, and brought them to this location and challenged them at Kakedameshi (field competitions). Well, how strong was he really? He was about 170 cm tall, and because he was slim he was good at kicking techniques using his foot and toe strength as well as adept at jumping techniques. Although he was slim in build, he had great body strength because he had trained using the traditional Okinawan body training method using techniques such as bottle gripping, using iron geta, etc. He was said to be able to grab onto ceiling beams with his fingers and maneuver around, and that he was able to hang from the ceiling using his toes. It was also said that he was able to move or hide his testicles in his abdomen, a process called ‘Kuh-ga’. Even taking into account that some of the above claims are exaggerated, the numerous scars on his body which were observed by his students in his later years, leaves no doubt that he was called the Challenging Chinen. In 1922 Tsuyoshi Chitose went to Tokyo to study as a medical student. After graduation he practiced medicine, but he also taught (at the Shoto- kai) at Funakoshi Gichin’s Yotsuya Dojo to the oldest son, Yoshiei, Otsuka Hiroki, Konishi Yasuyuki and Nakayama Tadatoshi, etc. One day the question was raised of who was the strongest person in Japan. As soon as someone replied that is was Nakayama Hiromichi of kendo fame, Tsuyoshi Chitose was off to Nakayama’s dojo. “What do you want?” asked Nakayama. Chitose replied “I am here to challenge you.” They agreed to a confrontation, with Nakayama holding a Japanese sword and Gochoku with only his empty hands. “I will give him one of my arms, but instead…”, Gochoku who thus made up his mind emitted bloodthirstiness (commitment? J.S.). Nakayama who sensed it also showed death in the air. The two stared at each other for about an hour, each unable to make the first move. Each knew that one of them moved, then one would die; they recognized each other’s skills and later became good friends. For some reason, after the War Tsuyoshi Chitose decided that he would never again set foot in Tokyo and moved to Kumamoto. In March 1946 he opened the karate-judo Yosei-kan in Kikuchi City, Kumamoto. This is the headquarters of the Chito Kai. Chitose lived his life as the consummate martial artist, honing his skills and strengthening himself, and became the master of a dojo at the age of 46. 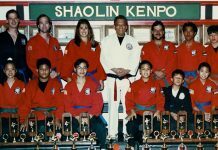 He stopped being a physician, and took on students and dedicated his life to karate-do. In 1948 Tsuyoshi Chitose became the director of the Kyushu headquarters of the All Japan Ken-po Karate-do Fukyu-Kai (promotional group) (as an aside, the directors of this Kai in the Tokyo and Kansai headquarters were Funakoshi Gichin and Mabuni Kenwa, respectively). During this period when Chitose encountered fights between the occupation forces and locals, he tried to stop them, but instead he wound up knocking everyone down. These unfortunate incidents turned out to be a blessing in disguise, because instead of getting into trouble, it ended up that the occupation forces recognized his skills. Gochoku immediately became a karate instructor at the Shimizu camp in Kumamoto where American forces were stationed, and so taught many foreigners. Some of the American soldiers were confident of their wrestling and boxing training often challenged Gochoku who was rather small in stature. In any event, Gochoku still possessed the fighting spirit, and took on each challenger in turn and beat them all. This was further proof of his strength, and resulted in strengthening of trust. Chito Ryu is now widely spread throughout the world, due mainly to Gochoku’s instruction of the American occupation forces. In 1952 Tsuyoshi Chitose named his own group the All Japan Chito Kai, and its technical style as Chito Ryu Karate-do. Chito means that its origin is in the ancient Chinese martial arts and has a long history and tradition going back hundreds and even thousands of years. Needless to say, Chito Ryu Karate-do is the fruit of Tsuyoshi Chitose’s long years of constant effort, training and experience. Chito Ryu is the accumulation of Gochoku’s ideals and beliefs. Let us analyze Chito Kai and Chito Ryu Karate-do from the point of view of Chitose’s ideals and beliefs. Tsuyoshi Chitose had considerable fighting experience. Therefore, the karate-do which Gochoku aims for is the actual fighting and martial art spirit. “Sun dome” (stopping just before making contact) is not favored. The object of karate-do is to make contact and with this contact the zest of karate-do can be experienced. 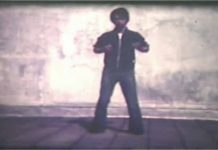 But at the same time, because he had a lot of fighting experience, he was well aware of the dangers of actually using the karate techniques. This troubled him greatly and gave considerable thought to safe ways of hitting. The result was his idea of using protective gear. Fighting with protective gear may make it safer, but on the other hand, the actual fighting experience will not be as authentic. Hitting and kicking will not become reality until it actually happens, and even when one makes an accurate hit, one will not know if the opponent will fall. If protective gear is used, the movements will be slowed down. Safety and actual fighting do not mix together well. However, except for someone like myself, for the general public, for young people, is actual fighting necessary? Even if protective gear is used, if one actually hits, it is better than not hitting at all, although it is not the same as actual fighting. The conclusion reached by Tsuyoshi Chitose was the regulation to use protective gear for competitions. Why did Gochoku, who spent much time as a wild fighter, come to regard safety as so important? He was once a physician, and also considered becoming a lawyer. The blood in his body was not only animal-like with aggressive fighting instincts, but also contained a strong base for seeking social justice. These two seem incompatible, but can it not be considered that inside the martial artist who has been constantly training for so many years, the different ideals can co-exist within? Many aspects of Chito Ryu Karate-do are based on anatomic physiology that Chitose added because of his experiences as a physician. For example, there is ‘Seisan Tachi’ which is the posture of standing, and the stretching forward and backward of ‘Sanchin Dachi’, which decreases the likelihood of damaging the hip area than Zenkutsu dachi and Kokutsu dachi. Furthermore, Zenkutusu dachi and Kokutsu dachi can only be effective for one-on-one fighting, with the latter effective for one to many fighting cases. 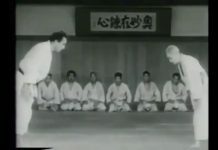 After careful consideration of these points, Gochoku concluded that Seisan Dachi was an important standing posture, and in Chito Ryu this is often used in Kata and Kumi-te. Also, there is Niseishi and Sanchin-kata, where both arms are positioned at mid level (kata-uke). He regarded the original kata had the danger of pressing on the heart, so he said that the arms should be spread apart more. 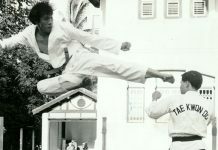 Thus, Tsuyoshi Chitose gave consideration not only to the safety of the opponent, but also in kata, and changed the original karate. As seen in Seisan Dachi, these changes are still based on actual fighting. Chito Ryu Karate-do considers not only Kumite, but actual fighting is emphasized. Kata is also regarded as important, and the teaching of it is promoted. As mentioned above, Gochoku learned both Naha-te and Shuri-te, and sought his own karate-do by considering the strengths and weaknesses of both forms. Thus, the Kata of Chito Ryu that is taught contains aspects from both Naha-te and Shuri-te. Tsuyoshi Chitose developed Chito Ryu as an actual fighting karate based on safety, and at the same time made it a dignified form of karate whose long history and tradition originated in the To (T’ang J.S.) Dynasty of ancient China. These are the sayings that Chitose favored in his later years. Gochoku used them as his foundation, and for Chito Ryu Karate-do he constantly talked of healthy growth of youth, contribution to society and friendship in the world. 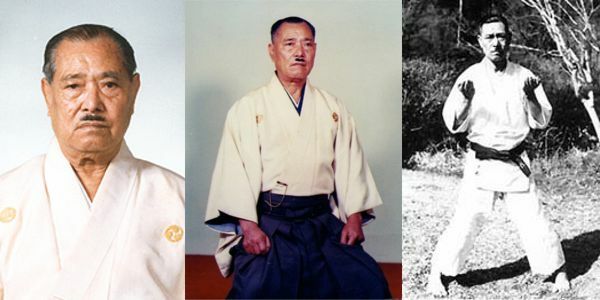 He was not only the founder of Chito Ryu; Soke became the friend of many in the martial arts area such as Miyagi Chojun and Nakamura Shigeru of Naha-te, Takano Sasaburo of Kendo, Nakamura Hakudo of Iai- do, Kano Jigoro and Mifune Kyuzo of Judo, and he also contributed greatly to making the traditional Okinawan martial art a Japanese martial art. He passed away on June 6, 1984 in Kumamoto City at the age of 86. At present his son Yasuhiro is the 2nd generation Soke. With Wa-nin and Riki Hittatsu as the basis, he spends his time training and honing skills with all instructors and students in Japan and around the world.